The “Snak Shak” is OPEN starting TODAY upstairs in room 212. It w It’s open daily starting at 8:05 until 8:20 when the bell rings. They sell a variety of snack items so go and see what they have this year available to purchase! Student Council will be selling reserved parking spots for students to purchase. Juniors can purchase remaining spots today and Tuesday during lunch. Next Wednesday anyone else can purchase leftover spots or there is plenty of spaces available that you do not have to pay for. The cost is only $20 and the reservation lasts all school year while school is in session. Please see the pink flyers around the building to see which spots you can purchase. Auditions for the fall play will be this Thursday and Friday in the library from 3:30-6:00. The play is called “North Woods Nonsense”. Check out the theatre bulletin board downstairs next to the library windows for more information! Attention Seniors! The Jostens rep will be at the high school Wednesday, August 29th for a presentation on Senior Graduation items. Orders will then be placed the following Wednesday, September 5th during the lunch hour. All Seniors need to be in attendance at the meeting that day. Students: you have 6 days from the beginning of the semester to Add or Drop a class. The 6th day will be this Wednesday, August 29th. However, students may Drop a Class without any penalty until the 5th Week of the semester. The end of the 5th Week is on Wednesday, September 26th. 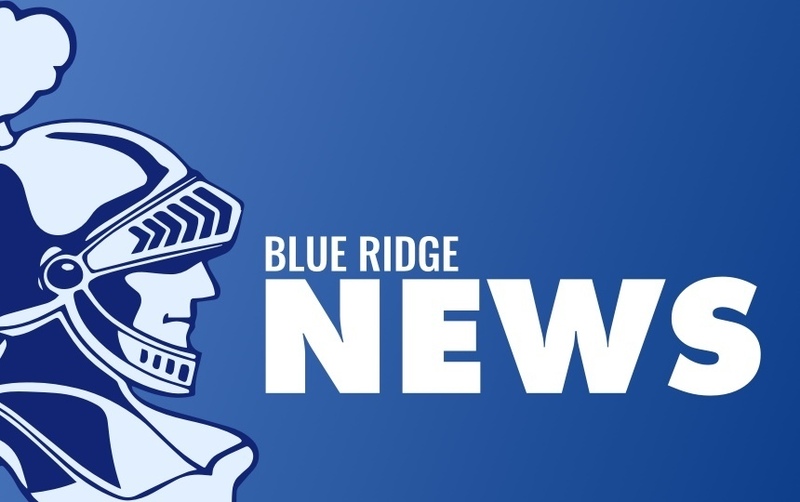 The Blue Ridge Knights Football Team opened the season with a 28-0 win over Martinsville. Brady Masengale had 2 passing touchdowns and 2 running touchdowns. Wayne Bowns and Kolby Kramer each had a receiving touchdown. Wayne Bowns and Dominic Gentry added two point conversions. Defensively, Kolby Kramer and Keegan Lyle led the team in tackles with 11 each. Logan Smithson, Wayne Bowns and Joe Smith each had an impressive 3 sacks. Please join us <="" span=""> as your Knights are at home against Oblong High School at 7pm. In the Uni Soccer Shootout on Saturday the Knights were defeated by Fisher/GCMS 2 to 0, Uni High 4 to 0 then they won their last match 4 to 1 over Oakwood. There were goals by Lane Nichols, Jacy Dean and Brenden Flannell. Bradley Flannell stepped in to play keeper for the injured Abby Bolen. He had 5 saves. Congrats to the Varsity Volleyball team for placing 2nd in the 10 team Blue Ridge Early Bird Invite on Saturday. The Knights defeated Uni-High 25-5, 25-4; Heritage 25-19, 17-25, 15-8; Low-Point Washburn 25-10, 25-12 and Donovan 25-12, 25-11 all in pool play. In the championship match the Lady Knights played well but came up just short to Cerro Gordo in a thrilling three set match losing 25-20, 23-25, 12-15 to push their overall record to 6-1. Congrats to Avery Fisher, Polly Reynolds and Hannah Brackenhoff for being named to the all-tournament team. Leading the Knights were Avery Fisher with 73 assists followed by Hannah Brackenhoff's 43 digs; Polly Reynolds 29 kills and Meah Carter's 5 blocks. The Lady Knights are back in action today at Fisher with the frosh match starting at 5 pm. A HUGE Thank you to all the staff, parents and volunteers that helped in the Volleyball tournament on Saturday. It was a success with all of your help! Today the Girls Golf team competes in the HOME Blue Ridge Triangular meet beginning at 4:00 at Woodlawn and the Volleyball Team travels to Fisher with the Freshman beginning at 5:00 followed by the Junior Varsity and then the Varsity.